The factors contributing to the greatness of a first-rank liberal arts college are difficult to analyze. Hidden from view in the mysteries of tradition and institutional aura, the insistent questions remain: How has it been done? Can it still be done? In an intensive analysis of three highly regarded liberal arts colleges, Burton R. Clark uses a developmental approach to formal organization to seek out answers to these questions. The author begins with a presentation of the historical development of three colleges, Antioch, Reed, and Swarthmore. He describes in detail how broad institutional innovations were introduced and made to endure. He then carefully notes the unique events, special conditions, and unusual features that are the components of each institution's fabric. Each of the three narratives is guided by comparative categories, that produce analytical and theoretical insights into organizational development. From the above data Clark develops the concept of the "organizational saga" as the central ingredient in the making of the distinctive college. He explains this concept in terms of organizational role and mission, using the historical narratives of the first section to suggest the bases for the development of sagas. 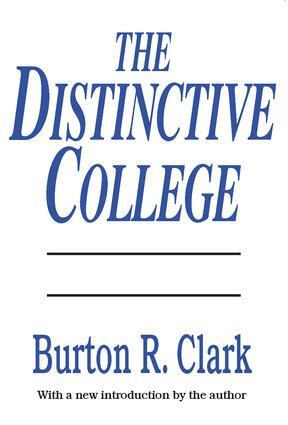 In its empirical findings and conceptual formulations, The Distinctive College, first published in 1970, has played an important role in the analysis and understanding of college culture in contemporary America. It is a study of leadership, as well as an examination of how values are realized in the everyday routine of participants in the life of educational organizations. It remains the premier sociological study of institution building in American higher education.